In the latest study on the ‘State of Ecommerce’ in India conducted by ASSOCHAM and Comcast has unearthed several interesting aspects of Internet usage in the country, and the penetration of retail shopping using digital medium. 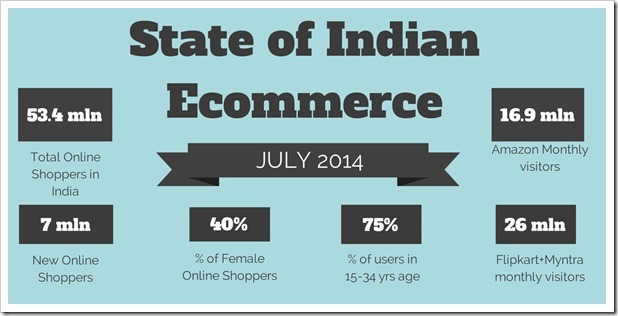 – India has added 7 million new Internet users who shop online, as per July data. – Apparel niche is growing at a rate of 66% per year, whereas fragrances and cosmetics grew at 12%; Health and Home Furnishing are sectors which are growing excellently. The report provides a glimpse of the unprecedented growth which Indian eCommerce industry is currently witnessing, which is fueled by billion dollar revenues of Flipkart and billions of dollars of investment promise by Amazon along with several more investments and ventures in this space. Jabong, Snapdeal and eBay are closely following the industry leaders, and collectively, this is an amazing time to be in the industry. Do share your opinions and insights based on the findings of this latest report by commenting right here!